Photos clockwise from upper left: male Yellow Grosbeak (El Triunfo), leaf-mimic katydid (Limonal), male Streak-backed Oriole (Sumidero Canyon in central lowlands), Hairy Woodpecker, race sanctorum, carrying food to nest (El Triunfo). 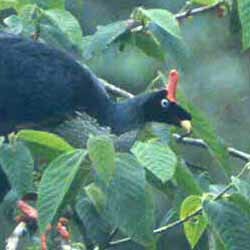 El Triunfo is best known as holding the world's largest concentration of Horned Guan, a huge, dramatic, and endangered cracid whose entire world range is restricted to isolated cloud forests in Chiapas and adjacent Guatemala. I have an entire Horned Guan page devoted to this near-mythical guan. I first visited El Triunfo in 1986 when I was young and energetic (below; top left), and then again in 2002 when I was worn-out and pushing 50 (below; top right). 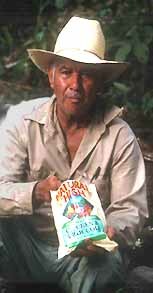 Fortunately, Victor Emanuel did not change from 1986 (below with Don Rodrigo, bottom left) to today (below with Ismael Valdez-Valdez, bottom right). The trail is beautiful but long and physically challenging. During the storms of fall 1998, many portions were washed out but have been rebuilt by the local horseman. One such new traverse, on the Pacific side above Canyon Honda, is shown above in a 2002 photo. 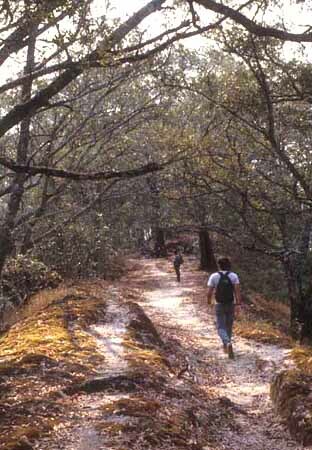 There is a particularly interesting long run down a ridge (right in a 1986 photo), through oak woodands, where the path is worn deep by decades of use. This is the only cross-Sierra route in southern Chiapas and is used by local villagers to work the coffee farms to the east. 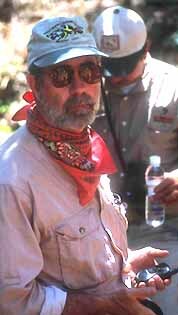 Those making the Pacific side hike in 1986 included leaders Victor Emanuel & Kevin Zimmer, plus Allan Keith, Wendy Paulson, Hugh & Kit Pratt, Karin Bevolzheimer, and Bob & Gail Debellevue. 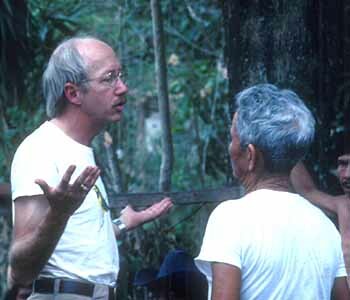 Co-leaders with Emanuel in 2002 were Brad Boyle (left; a little dazed after seeing our first Horned Guan) and Greg Lasley (right; note walkie-talkie in hand for subgroups to keep in touch with each other); tour participants were Susan Barbour & her mother Jane Low, Jerry Broadus & Clarice Clark, Larry Broeren, John Fitch, Jessica Jenner, Paul & Ursula Koldovsky, Kent Lannert, Greg Osland, Roy Rodwell and John Rothman. 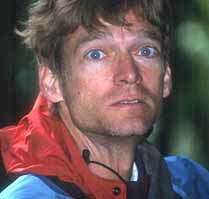 While I am a passionate birder, I am also very interested in mammals and herps (reptiles and amphibians). 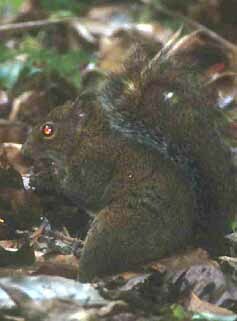 Photographed with a flash in the El Triunfo forest (right) is a Deppe's Squirrel Sciurus deppei. 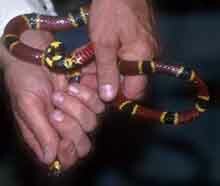 Click on the photo of the coral snake (below) to bring out a full page on the herps of El Triunfo. Finally, click on the button below for an annotated trip list that compares and contrasts 1986 and 2002. 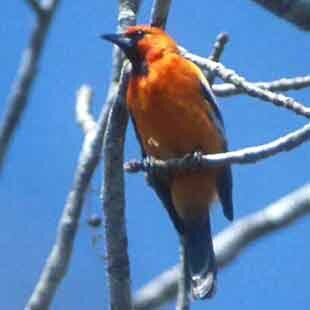 You can also find details of the avifauna in Gomez de Silva Garza et al. 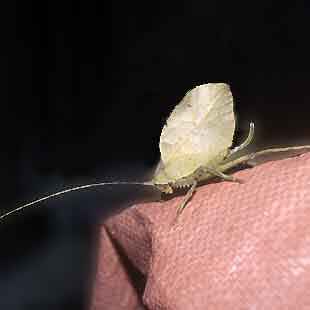 (1999), Howell (1999), and Parker et al. (1976). Andrle (1966) has an interesting photo of the El Triunfo clearing back in the 1960s. 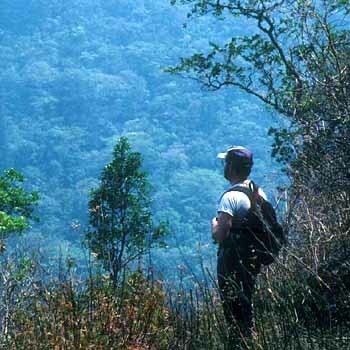 You can reach Victor Emanuel Nature Tours at this link. I recommend doing the trip with them because of the logistics, the expertise of the guides and their tapes (very helpful with many shy and difficult birds, if not the Horned Guan), and mostly because VENT as done much over the last quarter century to promote protection of El Triunfo and solidify that protection by getting money into the local economy. Don Rodrigo has passed one but we met his widow in 2002 and his family continues to provide the horses annually for the El Triunfo adventure trek. 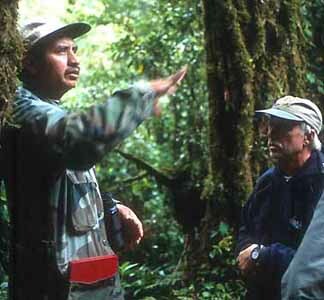 However, it is possible to arrange your own trip through El Triunfo Biosphere Reserve and their ecotourism project. They can arrange pack animals and transport to the trailhead from Tuxtla Gutierrez. You will definitely want to visit in the dry season (January-June; March-April best) as the trails are essentially impassable during the rains. It can rain at any time but rains start about May and intensify July-October. 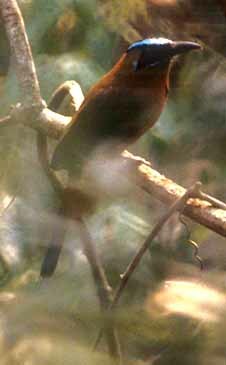 The Reserve has recently posted an El Triunfo Biosphere web site (currently in Spanish only) with a variety of photos. 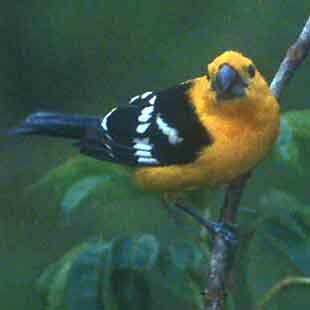 For another perspective, see Joelle Buffa's (2002) nice account of her experiences on VENT's March 2001 trip in the May/June 2002 issue of Bird-Watcher's Digest. 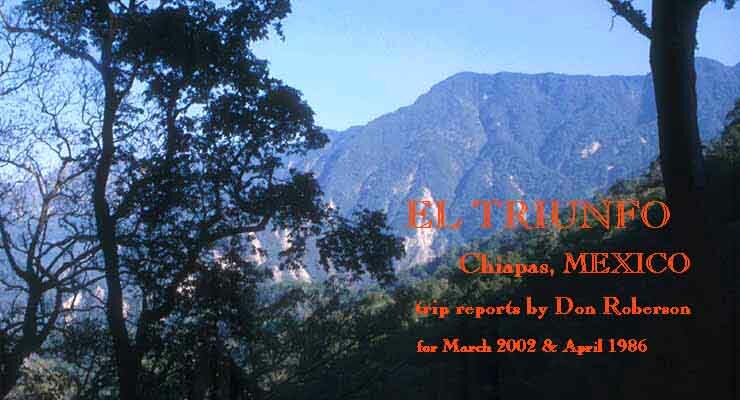 PHOTOS: All photos were taken during El Triunfo trips in Chiapas, Mexico, in April 1986 or March 2002. All are © 2002 Don Roberson, all rights reserved. Andrle, R. 1966. Horned Guan in Mexico and Guatemala. Condor 69: 93-109. Buffa, J. 2002. 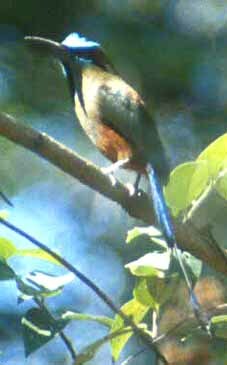 Birding El Triunfo Biosphere Reserve: a tale of Horned Guans and horseman. Bird-Watcher's Digest 24: 98-107. Gomez de Silva Garza, H., F. Gonzalez-Garcia, and M. P. Casillas-Trejo. 1999. 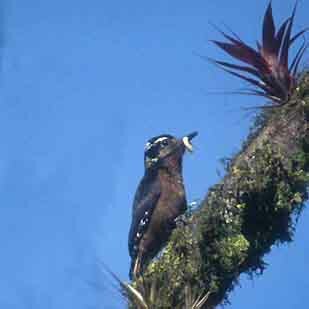 Birds of the upper cloud forest of El Triunfo, Chiapas, Mexico. Ornith. Neotrop. 10: 1-26. Howell, S.N.G. 1999. 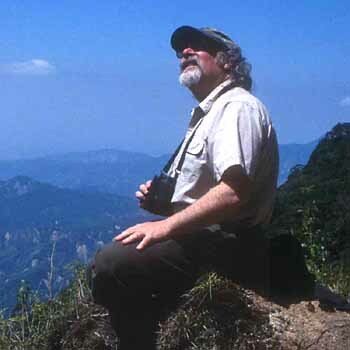 Where to Watch Birds in Mexico. Christopher Helm, London. Parker, T. A. III, S. Hilty, and M. Robbins. 1976. 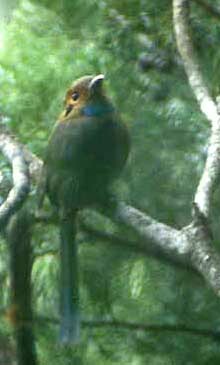 Birds of El Triunfo cloud forest, Mexico, with notes on the Horned Guan and other species. Amer. Birds 30: 779-782.